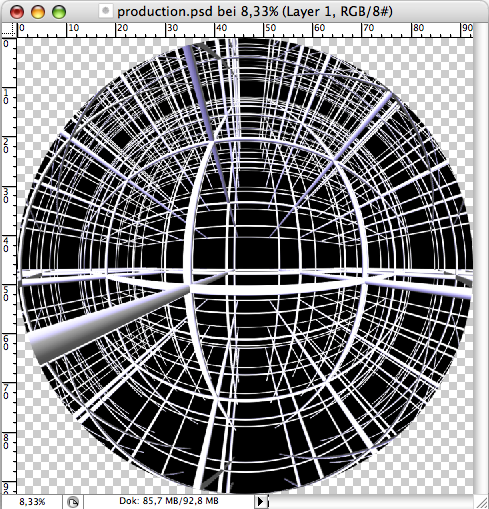 Mapping a equirectangular projection onto a sphere for making globes is done in different ways. Traditionally gores in a form of orange peels from pole to pole are cut out and glued onto a glass ball. In the print special care is needed to ensure that the paper allows the absorbtion of water and this property is not impaired by the print color. The paper grain must go along the equator of the gores. Also possible seems a so called flower petal pattern where the surface of the planet is cut in two hemispheres along the equator and the poles make the center of the flower petal. This approach is perfect if you are making a globe from cardboard (Video here or there), but when you want to use glue to stick thin paper on a sphere this isn't an option since the orientation of the paper grain defines the way the paper expands when soaked in water based glue. A third way is that the globe image is printed on a film which has thermoplastic properties and is stretched on the hemispheres in the manufacturing process. This is how the most commercial globes are made today. ppmglobe and the make_gores script fail to produce the proper results because they all don't take into account that the gores themselves stretch across the sphere when glued on it. Instead of warping the points of each gore they just compress the pixels across the width. Seemingly these algorythms follow this wrong example. The proper projection is nicely illustrated here by Böhm Wanderkarten, this page also features a program in assembler for the image manipulation which I didn't test yet. The Books Map Projections - A Reference Manual by Lev M. Bugayavevskiy and John P. Snyder, 1995 ISBN 0-7484-0304-3 on page 222 and Kartographische Netzentwürfe by Karlheinz Wagner, 1949 (and 1962) ASIN B0000BP33E on page 155 f feature correct calculations. where k is a constant parameter, usually equal to 2 and s is the meridian distance of φ from the equator. If φ = 0, x = kRλ. To allow for the deformation from the curvature of the ball while maps are beeing pasted onto it, projection coordinates are multiplied by a constant coefficient determined from experience. End quote. The Flaming Pear's Flexify 2 Photoshop Plugin does a good job but the coefficient mentioned in the formula above is not settable and the overlapping of gores for easy ajustment is not possible. Flexify 2 only offeres a colored tab for the glue instead. Thus it is not optimal but the the only option to produce correct results so far.